NASA flag bearer Raila Odinga arrives with his granddaughter for the presidential debate at Catholic University of Eastern Africa yesterday. Courtesy photo. Kenya’s National Super Alliance (NASA) presidential flag bearer Raila Odinga has said there will be no violence after the August 8 polls adding that NASA is willing to concede defeat if fairly beaten. “In the unlikely event that we do not win we will congratulate Jubilee. There will be no violence,” Raila said, calming fears of a repeat of the bloody post-election events of 2007/08. “Kenyans in urban areas should not run away. Let us come out and vote. We should not lose even a single vote because of fear,” he said. In 2007, violence broke out and spread from the Rift Valley area with definite ethnic undertones. Entire émigré communities were forced to flee in the face of politically-motivated lynchings. Scores of badly shaken Kenyans crossed the border into Uganda which was itself severely affected by the chaos. Supplies of certain essential commodities and fuel were cut off, forcing prices through the roof where the precious resource could be found. He also said it was wrong for Kenyans to propagate the view that both President Uhuru Kenyatta and himself enjoy the trappings of dynasties. The Opposition leader said he joined politics of his volition, unlike claims that he was seconded by his late father Jaramogi Oginga Odinga, a colonial era freedom fighter and one of that country’s founding fathers. Oginga was Kenya’s first Vice President in Jomo Kenyatta’s administration after the country attained independence. Uhuru, on the other hand, is the son of Jomo Kenyatta who had worked with the older Oginga Odinga after the British colonial era. The two families have dominated the Kenyan political scene over the years with the competition for the presidency centred around them. This has been the case save for the time when retired President Daniel Moi was at the country’s helm for 24 years and when Moi’s former finance minister, Mwai Kibaki, held power. Even at that time, Raila emerged as the frontrunner in the calls for multi-party democracy before Moi chose Uhuru as his successor ahead of the 2002 polls. The Kenyan opposition leader said he has risen to the helm of Kenyan politics by virtue of his own drive. “It is wrong to allege that Kenyatta and Oginga Odinga families have held Kenya at ransom. While Uhuru was invited into politics by his mentor, I came into it alone. 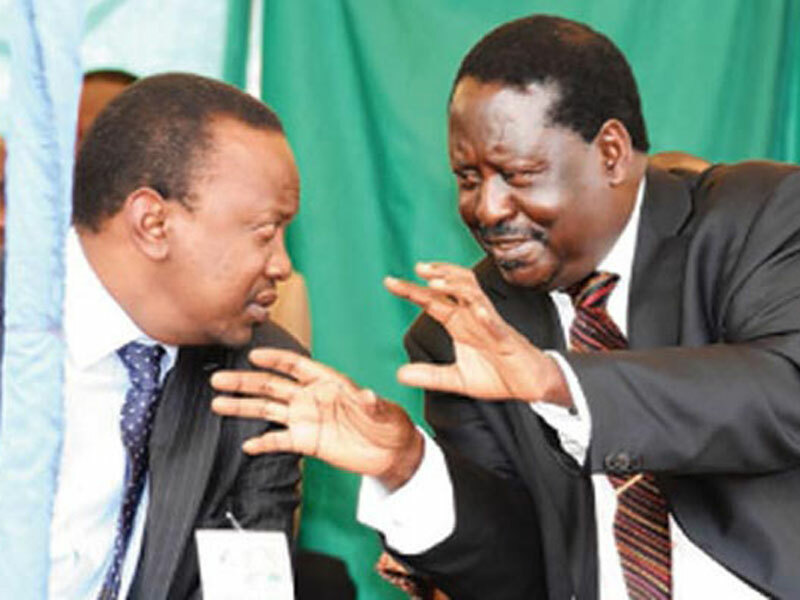 It was not through the invitation of my father but out of conviction,” Raila said. The two are facing off in the August 8 general election which has also attracted six other candidates. The post-election violence in 2007 left over 1,300 dead and 650,000 displaced from their homes and businesses. The closely contested election of 2013 had Odinga and Kenyatta supporters engaging in sporadic incidents of violence. A portion of the rail line which connects Uganda to the Mombasa port was ripped up by youths who accused Uganda’s leaders of taking sides in the election which they believed was rigged for Kenyatta. The situation, mercifully, was contained before it spiraled out of control. It is against this background that Kenya’s neighbours like Uganda, which heavily depend on it as a gateway to the sea trade routes, are anxious about how things will turn out this time. Meanwhile, Kenyans have taken to social media to attack President Kenyatta for missing the highly anticipated Monday debate. He had until the last minute not made it clear if he would attend the debate, having claimed that the organiser’s did not engage his team throughout the preparation.